Render happy moments to your loved ones with this Classy School Time Minnie Tiffin Set and frame it forever in your memory and heart. 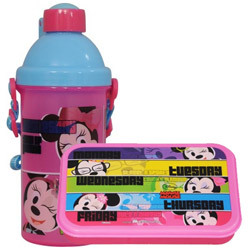 This Minnie Tiffin Set is introduced with Blue N Pink Color Tiffin Box and Water Bottle. The key features of this Tiffin Set include Air Tight, Non-toxic and Safe, made from High Quality Food Grade PP Material, Leak Proof, Compact and Microwave Proof.